Your child may have received a 3-in-1 Apptivity Entertainer for their birthday or maybe even last Christmas. If so, you will be pleased to know that Fisher-Price has just released some brand new content that is compatible with their 3-in-1 Apptivity Entertainer. Released on May 11th, the brand new ‘Roly Poly Animals’ app from Fisher-Price is a fun new way for children to play with their Apptivity Station. 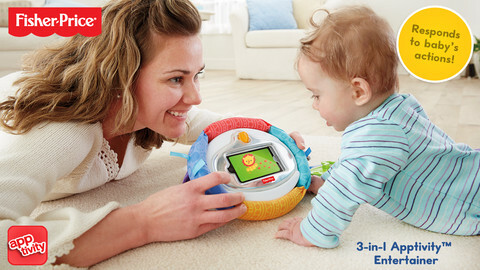 ‘Roly Poly Animals’ is designed to especially to work with the Fisher-Price 3-in-1 Apptivity Entertainer. This accessory is a toy that has a slot to put your iPhone in. It acts as a case and a way for babies to interact with apps made for the toy. Once the phone is inserted into the 3-in-1 Apptivity Entertainer, Roly Poly Animals provides animals, colors and shapes that are designed to stimulate baby’s senses during tummy time. The Apptivity Entertainer sports two ways to interact with this app The ‘kickstand’ option allows parents to set the Entertainer in front of babies who are too young to hold the toy and the ‘rocking base’ option allows the 3-in-one Apptivity Entertainer to be rocked, rolled and played with. Fisher-Price promotes their apps and app compatible toys by claiming that they promote the development of fine motor skills in very young children. They also claim to foster an understanding of cause and effect as well as enhanced self-confidence as babies learn how to make the same thing happen over and over again. While this app and toy are marketed to the under-one crowd, I can see it still being fun and beneficial for children as old as three. I mean…who doesn’t love cute animals and a fun iPhone case? If your child has the Fisher-Price 3-in-1 Apptivity Entertainer and you want to shake things up with a new app, click the Apple iTunes App Store button below to download the compatible app ‘Roly Poly Animals’ for free!